Give your guests and customers the confidence to make booking decisions online with CartoBlue's visual marketing products. Using products from CartoBlue is an easy way to turn online lookers into online bookers. Build trust with online shoppers and potential guests by showing them exactly what to expect at your hotel or resort. CartoBlue's digital renderings, community maps, and interactive floor plans provide guests with more information about your accommodations and location. Being able to display your resort from a bird's eye view with a resort map allows you to show off more of your selling points. 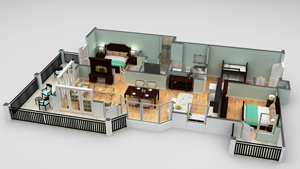 Noteworthy resorts such as Vail Resorts, Inc. in Colorado and St. Joe Club & Resorts in Florida have already started using CartoBlue's floor plans, renderings, and maps. 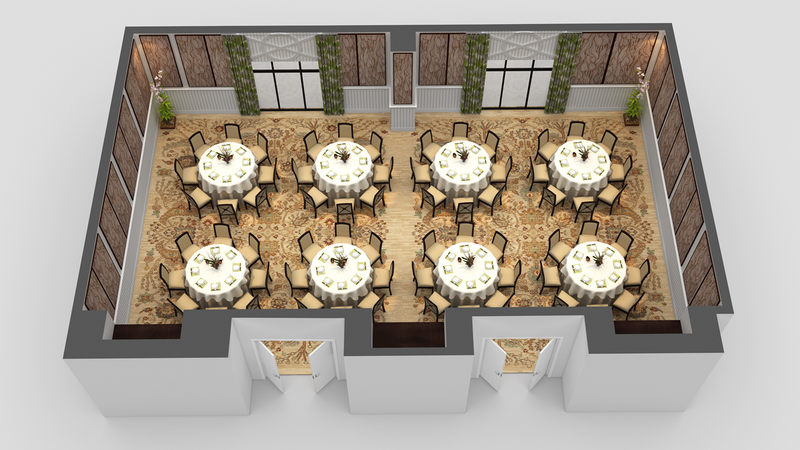 With these products, hotels and resorts can make a stronger visual impact on their clients. 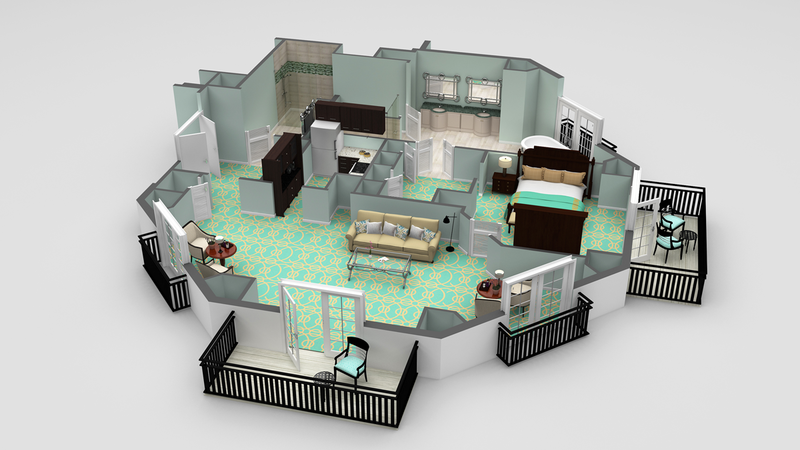 Three dimensional walkthrough tours of your lobby, conference room, or pool deck will make online shoppers and potential guests feel like they already have one foot in the door. 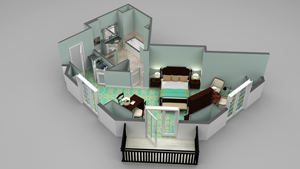 Resort maps from CartoBlue portray the entire resort, inside and out, in precise detail. The map will illustrate all of the resorts features, and give your guests insight into what the resort has to offer beyond the guest rooms. When guests can view a location in a large-scale way they have more confidence to book the property, especially if they're booking online. Our resort maps give vacationers who haven't stayed with you before a larger picture to familiarize them with the resort's best features. Once they can visualize the great experience they will have in the area, they are as good as sold. 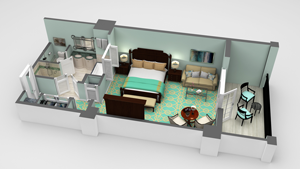 CartoVision is a 360-degree virtual walking tours to showcase hotels/resorts interior and exterior spaces. 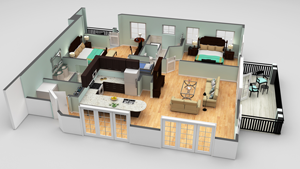 CartoVision is an all-in-one solution that provides HDR photography, an interactive floor plan, and a virtual walkthrough tour with virtual reality capability. Your clients’ search begins online, so give them the best interactive experience available with a CartoVision tour. Give guests an accurate view of your golf course with a digital, interactive rendering from CartoBlue. 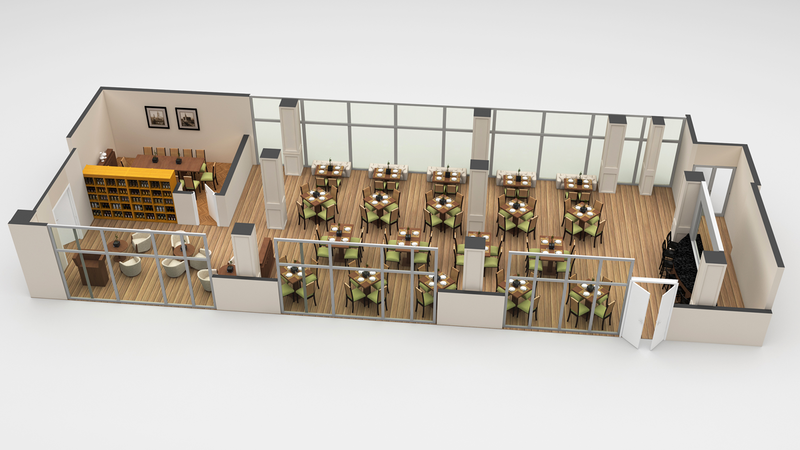 Golf course renderings allow your guests to see the golf course as a whole and to envision their day on the green. CartoBlue's golf course renderings are also useful tools for golf courses still in development. 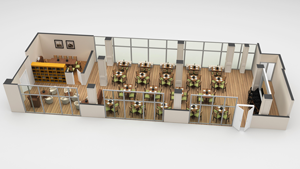 You can use the computer-generated rendering to depict the design of the finished course. Floor plans communicate essential information about a hotel room to potential guests about layout and accessibility. 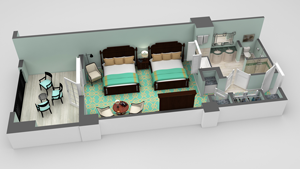 Knowing the arrangement of bedrooms and living spaces is important for travelers, especially travelers with children or large parties who'd like to designate sleeping arrangements before arriving. 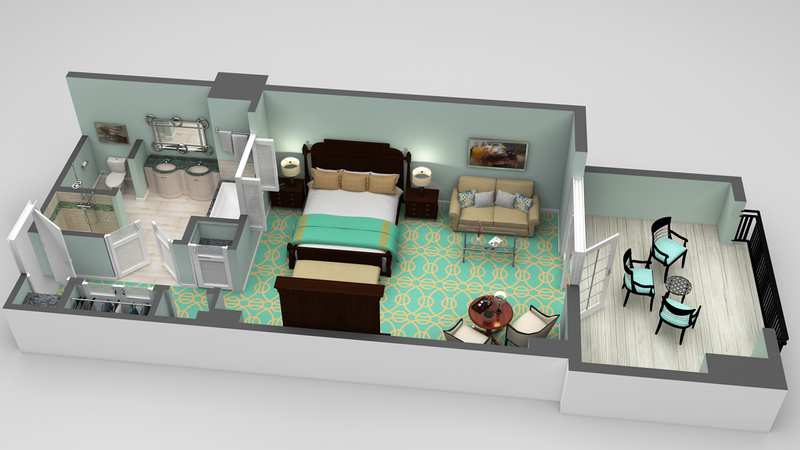 Two dimensional floor plans are a simple and effective way to provide your guests with more information about the room they're interested in booking. 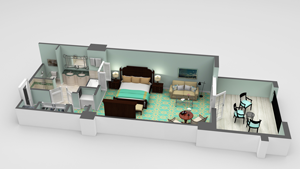 Your resort or hotel Web site will see more online user activity and more online bookings with the addition of interactive floor plans. 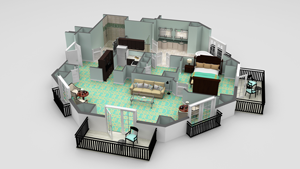 Three-dimensional floor plans are one of the most popular tools CartoBlue offers. 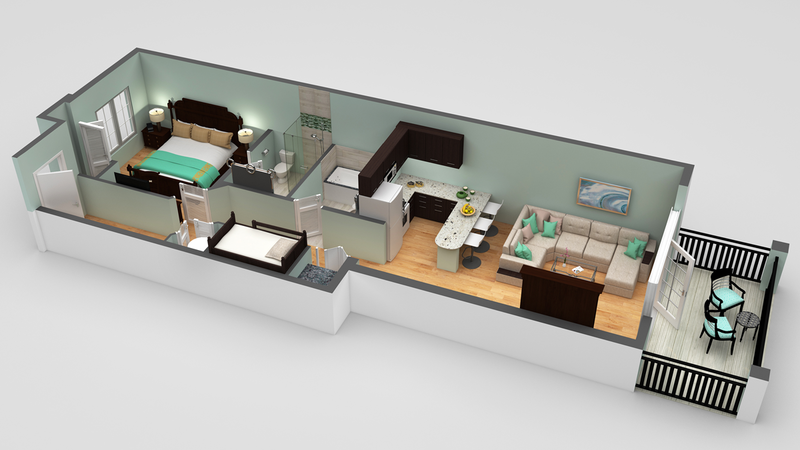 Our 3D floor plans give guests a better understanding of the hotel room's layout, features, and size. 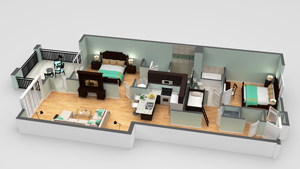 Not only is the floor plan customizable, but the finished product can be embedded directly into your website using the unique URL or HTML provided to you by CartoBlue. Hotels and resorts have found 3D renderings to be a great selling tool because the floor plans communicate more about the hotel/resort than photographs alone. 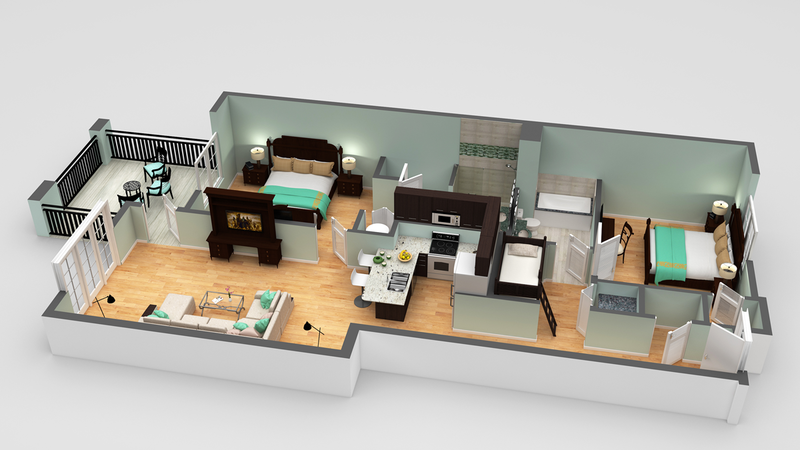 Your website will see more user activity, more inquiries, and more conversions with the addition of 3D floor plans from CartoBlue. 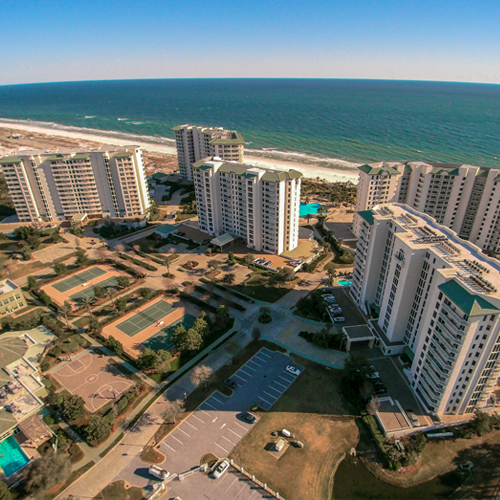 Drone videography is one of the most breathtaking ways to visually display your hotel or resort. The all-encompassing views captured by a drone video show your location from a holistic standpoint. You can capture all the hotel or resort's features and amenities in a single video with multiple marketing uses. Drone videography can be used in television advertising, placed on your YouTube channel as shareable content, or added directly to your Web site. 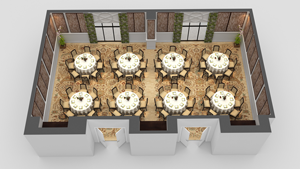 Drone videos can be taken of the entire exterior location, or of specific interior rooms such as pent house suites, ball rooms, conference spaces, and front lobbies. CartoBlue possesses a valid FAA 333 Exemption for legal drone operations.